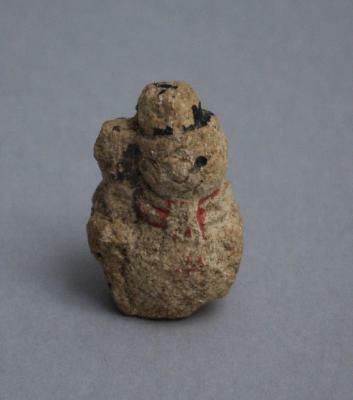 A small carved stone snowman with traces of coloured paint, found with the Fawley Court time capsule, buried in 1731 by John Freeman and retrieved in 1932. The Fawley Court Time Capsule was buried in 1731 by John Freeman, of Fawley Court. It included a collection of domestic items and tableware used in the kitchens and dining room of Fawley Court in a specially created mound in the grounds of Henley Park. The mound, erroneously believed to be a prehistoric barrow, was excavated in 1932. 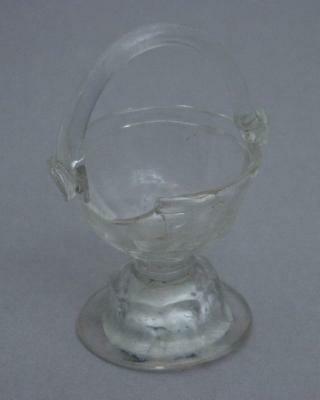 A glass basket, found in the Fawley Court Time Capsule. The Fawley Court Time Capsule was buried in 1731 by John Freeman, of Fawley Court. It included a collection of domestic items and tableware used in the kitchens and dining room of Fawley Court in a specially created mound in the grounds of Henley Park. The mound, erroneously believed to be a prehistoric barrow, was excavated in 1932. A section of window pane engraved with latin text. Found buried in the Fawley Court time capsule, originally buried in 1731 and excavated in 1932. The Fawley Court Time Capsule was buried in 1731 by John Freeman, of Fawley Court. It included a collection of domestic items and tableware used in the kitchens and dining room of Fawley Court in a specially created mound in the grounds of Henley Park. The mound, erroneously believed to be a prehistoric barrow, was excavated in 1932. 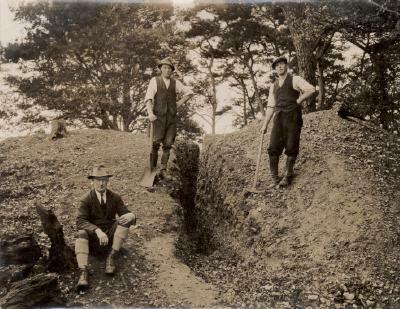 A black and white photograph of the excavation of the mound containing the Fawley Court time capsule in 1932. It was originally buried in 1731. The Fawley Court Time Capsule was buried in 1731 by John Freeman, of Fawley Court. It included a collection of domestic items and tableware used in the kitchens and dining room of Fawley Court in a specially created mound in the grounds of Henley Park. The mound, erroneously believed to be a prehistoric barrow, was excavated in 1932. Romano British pot buried in the mound with the Fawley Court time capsule, which was buried in 1731 (excavated in 1932). 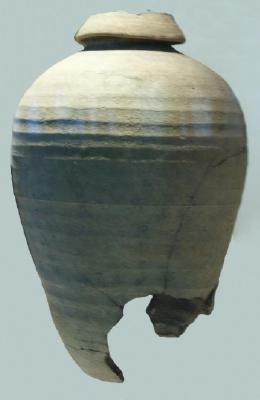 An expert in Archaeological ceramics has identified this pot as a Post Medieval Seville olive jar. These jars were imported in large quantities in the 17th and 18th centuries and are often found in places such as Southampton. It is unusual to find a near complete example so far in land. 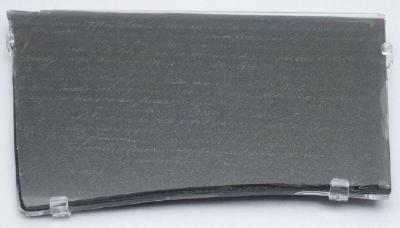 The only other example in Oxfordshire is a rim from the excavations at the Bodleian Library in Oxford. The Fawley Court Time Capsule was buried in 1731 by John Freeman, of Fawley Court. It included a collection of domestic items and tableware used in the kitchens and dining room of Fawley Court in a specially created mound in the grounds of Henley Park. The mound, erroneously believed to be a prehistoric barrow, was excavated in 1932. 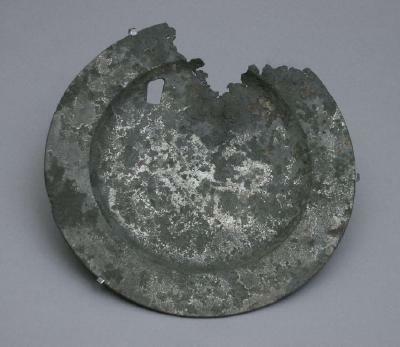 A pewter plate found in the Fawley Court time capsule, which was buried in 1731. The Fawley Court Time Capsule was buried in 1731 by John Freeman, of Fawley Court. It included a collection of domestic items and tableware used in the kitchens and dining room of Fawley Court in a specially created mound in the grounds of Henley Park. The mound, erroneously believed to be a prehistoric barrow, was excavated in 1932. 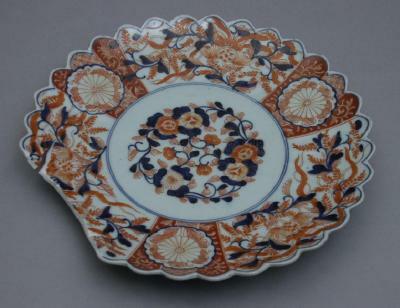 A decorated glazed porcelain plate found in the Fawley Court time capsule, which was buried in 1731 and excavated in 1932. The Fawley Court Time Capsule was buried in 1731 by John Freeman, of Fawley Court. It included a collection of domestic items and tableware used in the kitchens and dining room of Fawley Court in a specially created mound in the grounds of Henley Park. The mound, erroneously believed to be a prehistoric barrow, was excavated in 1932. 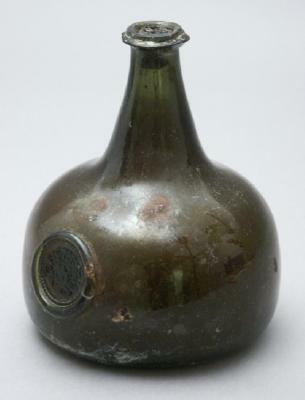 A green wine bottle with a seal bearing 'J Freeman' in embossed letters, found in the Fawley Court time capsule. The Fawley Court Time Capsule was buried in 1731 by John Freeman, of Fawley Court. It included a collection of domestic items and tableware used in the kitchens and dining room of Fawley Court in a specially created mound in the grounds of Henley Park. The mound, erroneously believed to be a prehistoric barrow, was excavated in 1932.